The islands of Hawaii could each easily be described as paradise. But even paradise has its hazards and we'd be foolish not educate you on at least a few of them. Please make sure you and your travel companions know about these hazards. Our statements below are rather candid because we want you to know the truth about the place you are visiting. This isn't Disneyland; it is often wild, rough, and natural law prevails out here. The more you know, the better prepared you are to avoid the hazards of the beautiful Hawaiian Islands. We've made this short section a chapter in all of our recent guidebooks, and that should show how much emphasis we put on this subject. 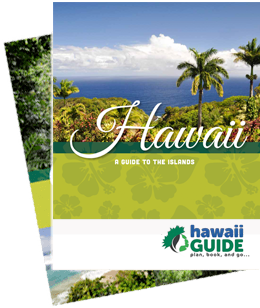 For the most part, you are very safe on the Hawaiian Islands from all animal and plant life. There are no large predators or snakes, and there are few plants that will cause irritation when hiking (no poison oak or ivy, for example). However, other hazards still exist. The main culprit we've come across in the animal world is actually an arthropod; the centipede. In Hawaii these aggressive arthropods carry quite a punch and getting bitten or stung by one is not what you want during your visit to the islands. The resorts usually spray for them very well, but be careful with any shoes left outside during the night, etc. Another arthropod that gets a lot of attention is the cane spider, but it's mostly hype. The brown cane spider is mostly feared due to its appearance/size. It is about the size of a can of tuna, including its long legs. Typically, it will run versus defend itself, and the bite of a cane spider is rarely dangerous. Nonetheless, it is worth mentioning. There are also scorpions on the drier sides of the islands, but they usually stay out of sight. Mosquitoes typically frequent the wetter sides of the islands, so prepare accordingly. Geckos are nothing to be worried about; they're the cute lizards that actually keep the bug population somewhat under control. On the Big Island, the other cute- albeit pesky- resident is the coqui tree frog. Especially prevalent on the Hilo/Puna side of the island, they will likely be music to your ears the first night. By the fifth night, you'll likely be plugging your ears! The coqui frogs are an invasive species that is threatening the balance of vulnerable native ecosystems. The many edible plants and fruits of Hawaii also create a hazard. Many visitors believe that they can pop just about anything in Hawaii in their mouths for a little taste... not so! Many plants here are poisonous and no fruits or plants should be eaten unless you absolutely know for sure it is safe. Remember that many plants have similar-looking fruits. The sun - A UV index of near 14+ every day speaks for itself. We recommend at least 15+ sun block in Hawaii at all times. Also, please be sure to use a reef safe sunscreen in order to help preserve Hawaii's delicate marine environment. Please don't ruin your visit by trying to get that tropical tan; the tan will be gone within a month of your return home; the sun damage and memory of the burns will last a lot longer. Our primary message here is short and sweet: Pay attention to the flow of the stream where you are and be aware of the weather inland. Streams and rivers can change flow rates and heights very quickly in the islands. Flash flooding is a regular occurrence in some places. One good rain, even far inland from where you are, can cause a stream to rise substantially. If you're crossing any streams or rock hopping, pay close attention to the weather and the water levels. Anytime you are crossing a stream or river where it empties into the ocean, we also advise crossing inland a bit. Dangerous rip currents can form in the ocean at the mouth of a river or stream. Hiking poles may be extremely useful for any crossings you do make, as they provide an extra set of limbs to help you keep your balance. If you go swimming, make sure you don't swallow any water, and try to cover up any open wounds you may have so that water can't get in them. In Hawaii leptospirosis can be found in water contaminated by animal droppings, and you do not want to get mixed up with the likes of this disease. It causes flu-like symptoms and, in rare cases, death. If you've ever been to the beach then you likely already know about the hazards of the ocean. Rip currents, sharp coral, large waves, surf, and various creatures are just a few. The most notable sea creatures to watch out for on the Big Island are coral, jellyfish (Portuguese Man-of-War), and sea urchins. If you plan to swim, snorkel, or SCUBA dive on the island, make sure to do your homework and become fully educated on the hazards of the ocean here. If you see a sign like this, Keep Out! The first thought that comes to mind when you hear about Hawaii volcano danger is probably the lava hazards. In reality, the 2,000°F lava probably poses the least amount of danger to the sensible person. Hawaii Volcanoes National Park and the surrounding Volcano area of the Big Island are subject to a number of hazards that are easy to overlook or just aren't something you'd expect without prior knowledge of the area. While this is mostly applicable to the Big Island, Maui is no exception as it has many areas covered with recent (geologically speaking) lava flows, as well - especially in South Maui. Let's go over a few of these hazards. Hiking on Lava: Around the Big Island and especially at the end of Chain of Craters Road, you will have the opportunity to hike over lava. As we mention on our Hawaii Geology page, there are two types of lava: pahoehoe and a'a flows. Grossly simplified, pahoehoe is smooth and a'a is sharp, brittle, and crumbly. Trying to walk over a'a is a fool's errand. The only lava flows that are traversable are hardened pahoehoe flows like those found at the end of Chain of Craters Road. Currently, Chain of Craters is the only location you can also safely approach active flows (when they are present). The dangers involved in crossing lava, even pahoehoe lava, are primarily due to the razor-like sharpness of the hardened lava. Even the pahoehoe flows are as sharp as glass, and you can easily cut yourself- especially your hands- in the event of a fall. Extreme care and precautions should be taken when hiking over lava. Long pants and gloves are always a good idea. The heat produced by the sun hitting the black asphalt-like lava surface deters many visitors from wearing long pants, but don't risk the injury. The pahoehoe surface is smooth but can contain all sorts of variations in the surface that can catch your foot or cause you to stumble. It is also important you remain keenly aware of the texture of the flows you are walking across, as shallow lava tubes can cave in, dropping you a few inches (or more) below the surface. If you plan to make any lengthy hikes, be sure to take adequate amounts of water as dehydration can occur quickly on the shadeless black lava surface. Viewing Active Lava Flows: As a continuation of the above hazard and warning, we again encourage all visitors to be prepared for any hiking they do on hardened flows out to see active flows. When approaching active flows your body will only let you get so close before the heat forces you to stand back, but use common sense and don't attempt to get any closer than you must to view the lava safely. Lava temperatures average around 2,000°F. Do not attempt to cross any active flow up slope as active flows are often concealed in lava tubes beneath the surface, and you do not want to find one by mistake. Do not cross any National Park boundary ropes in the park, as they are in place for your protection. The park service is fairly liberal about how close they will allow people to get to lava flows; so traversing beyond the boundaries they've set up is extremely dangerous. Usually, the roped-off areas are near the lava entry point into the ocean. Violent explosions, deadly steam plumes and gasses make this a treacherous area to be near. Furthermore, all lava benches are roped off for the same reason. Lava benches can easily collapse at any time spelling certain catastrophe for anyone on the bench at the time. Just two days before writing this article a 45-acre bench collapsed in a single night; yes, 45 ACRES! Volcanic Gasses & Vog: Where hot lava meets the sea, and especially at the source of the eruption, the volcano produces a deadly concoction of gasses. In fact, it's estimated that Kilauea puts out about 2,500 tons of sulfur dioxide a day. Enough of those fumes can kill someone almost instantly, (as if you needed another reason to stay behind those barriers the park service puts up). Even far away from the sources of these sulfur dioxide plumes, visitors can experience another type of gas- vog. Vog is a mixture of the sulfur dioxide gas, water vapor, carbon dioxide, dust, and other airborne particles. Vog exists in fairly high amounts all around the volcano area and can even wrap around the island into Kailua-Kona depending on trade wind activity. Hilo, Puna, Kohala, and the Hamakua coast are usually vog free. Vog can affect different people in different ways. Visitors with asthma and respiratory troubles will have the most problems. In our experiences with vog we've been mostly unaffected by it. It's unpleasant to smell, but it has never had any adverse affects on us. We have though, on a few occasions, had especially heavy vog settle upon us near the end of Chain of Craters Road- usually coming from Pu'u O'o up the pali/cliff- when the trade winds were blowing light. Usually, this causes coughing and a burning sensation in the eyes, nose, and mouth. If possible, avoid areas where you notice a lot of vog. Generally, you can see it in the air like a low cloud moving south down the coastline from the volcano (can you make it out in the photo here?). If you are caught in thick vog, try to get out of it as quickly as possible. You can call 808-885-7143 for a vog index update. If you want more information on vog, hiking over lava, and viewing lava safely, please consult the park rangers inside Hawaii Volcanoes National Park. There are many locations in Hawaii that are private property and visitors should make every attempt to avoid trespassing on such properties. If a trail says it's closed; it's closed. If you see a sign that says kapu then it's off limits. Do not explore places you're not sure about - waterfalls, pools, trails, caves, lava tubes, etc. You likely wouldn't want people exploring your backyard at home, so be mindful of and respectful to residents here. Your courtesy will be greatly appreciated. It may or may not surprise you, but we humans are one of Hawaii's greatest hazards. If you refer to the History of Hawaii page you'll learn about Hawaii's endemic species- species found ONLY in Hawaii. Thus, as visitors to these islands, we must remember that we ourselves pose one of the greatest hazards to the rare and endangered species that live here, and only here. There are a few general guidelines to follow while on the islands. 1.) As a general rule, it is best to stay away from all wildlife. In fact, you should know it's illegal to feed or touch wild animals in Hawaii. That means no feeding the geese (Nene), no touching the turtles (Honu), and no swimming with the dolphins. These three issues are something we hear about and witness a lot of in Hawaii. It seems innocent enough, but consider the consequences of your casual interaction with these creatures. Nene no longer fear our cars and are being killed off at an alarming rate. The touch of a human can deliver deadly infections to the honu as it basks in the sun or swims in a shallow pool. 2.) Kapu means kapu (off limits). Many areas that are now deemed as ecologically or culturally fragile have been made kapu (off-limits) by the government. Sensitive places include lava tubes, caves, burial grounds, heiaus (temples), etc. Please show hoihi (respect) for the laws that protect these beautiful and fragile places. 3.) Remember that trails and roads exist for a reason. It's easy to get off the beaten path and do a bit of exploring, but keep in mind that "just off that beaten path" in Hawaii could be the home to a variety of animals and plants you might not be aware of. 4.) Don't take the lava rocks or sand home with you; it's actually illegal to sell black sand in Hawaii. You're sure to hear the legend of Pele cursing all those who take her "children" away from the islands. If that won't stop you, know that local airport screeners will likely confiscate any they find in your luggage. If you follow these tips we can guarantee you that the Aloha you show will be very appreciated by everyone- people and animals alike. Mahalo nui!